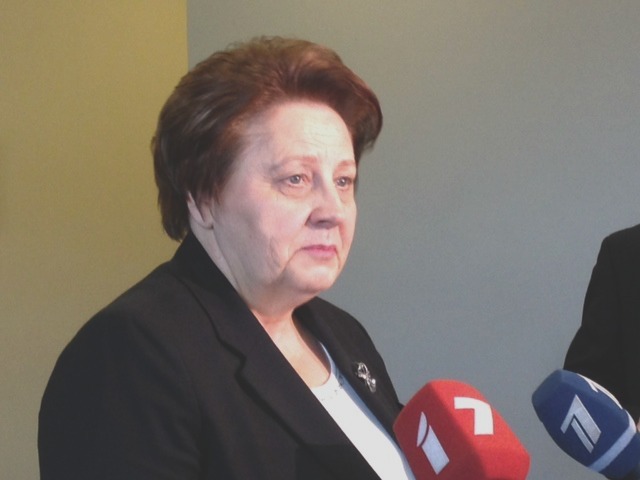 Ahead of the Eastern Partnership summit in May, Prime Minister Laimdota Straujuma of Latvia, which currently holds the Presidency of the EU, warned that if necessary, Article 5 of the NATO treaty will be enforced. We will not go back to the Soviet Union, she told EURACTIV in an exclusive interview. Laimdota Straujuma spoke to EURACTIV’s Editor-in-Chief, Daniela Vincenti. Europe is slowly but surely returning to economic growth. Structural reforms and investment are at the core of speeding up a sustainable recovery. Latvia is a success story that shows the way. How can this inspire others? As you already said, structural reforms, budget consolidation, export promotion and investment attraction are the tools Latvia used in order to achieve one of the fastest growth rates in the EU. I have been to various forums in different countries. I don’t ee any options other than attracting investment, promoting exports and boosting competitiveness, including competitive education, and structural reforms. Those are the prerequisites for having the money that we spend. In the long run, we can’t continue to survive on credit. Eventually, all credit lines run out, and then crises and all kinds of turbulence start taking place. We need to have a consistent policy that we implement step-by-step, we have to achieve growth step-by-step, and this growth must also be complemented by social improvements, as well. One of the major problems in Europe is investment. The Juncker Plan aims to relaunch investment and confidence in the EU. Will this be your legacy? I am very happy that on 10 March, EU finance ministers, in ECOFIN, approved the European investment plan in the Council. The European Parliament President Martin Schulz was also present, and he promised that the Parliament would do its best to make sure that the Juncker Plan was approved during the Latvian Presidency. I have talked to him myself, and I have spoken to all the major political groups in the European Parliament, and they have all promised to support this plan. On the other hand, it is very important to make sure that the structural funds are launched as soon as possible. You said in your opening speech in January that you want to see a more engaged and globally responsible European Union. What would be a sign of success? Concerning a globally engaged Europe, there are two dimensions. There is economic cooperation, and there is political cooperation. On the economic dimension, the Council has agreed to speed up the trade agreement negotiations, TTIP [Transatlantic Trade and Investment Partnership] in particula> hat will probably not be finalised during the Latvian Presidency, but we will make sure they are finalised during the Luxembourgish Presidency. Then in May, we will hold the Eastern Partnership summit in Riga. The joint platform of the partnership policy is very important for Europe, but approaches to each country have to be tailored because they are six very different countries. I truly believe that this summit will be successful and will be a source of inspiration to all six Eastern Partnership countries, both for their civil societies and for their economic cooperation. Our presidency started with the Paris terrorist attacks, and this of course led us to add security as our fourth priority. We will do our best to make sure that the broad lines of the European security strategy are approved by the June Council. There is still a lot to be done, not only within the Eastern Partnership, but also the Southern Neighbourhood. The High Representative is working very actively on Libya, for example. There is obviously a clear political momentum to move towards an EU security strategy. What do you want to achieve? We will start debating the security policy in the near future. I don’t suppose we will manage to go through all the rounds of negotiations quickly, but we will have to proceed step by step. We have managed to push through the Directive on Passenger Name Record (PNR) data, which is now being negotiated in the European Parliament, and I hope they will adopt it. But to ensure security and safety, a lot of coordination and information exchange is required. Do you sense the revival of a political drive on TTIP, despite blockage from civil society? We have had the discussion on TTIP in the European Council this month, and all 28 member states supported the political framework for TTIP, because of course it brings significant economic benefits. There was a debate on investment protection, for example, and some other issues that caused disagreement. But all the countries feel that we have to have this free trade agreement from an economic and export point of view. I would also like to draw parallels to the Latvian economy. We are a small economy, and if it weren’t for the investment of the structural funds and our exports, we would not have been able to recover from the crisis as successfully as we have. We relied on exports, and that is what has pulled us out of the economic hole. The same applies to the EU and US trade relationship. The Commission has said that signing TTIP would bring a further €100 billion of investment into Europe. Are we taking the right decisions vis-à-vis Russia? Baltic countries are on the front line. Well firstly, what is happening in Ukraine is absolutely unacceptable. The annexation of part of a country in Europe in the 21st century is totally unacceptable. Therefore, the constant support Russia is showing to the separatist forces in Ukraine is not a way to gain our trust. And given our past in the Baltic States, and our history with Russia, it is very important for us to be in the EU and NATO. NATO training in Latvia, the Baltics and Poland helps guarantee our safety, so it will protect us, and if necessary, Article 5 of the NATO treaty will be enforced, because this concerns our history: We will not go back into a totalitarian regime like the Soviet Union. The Latvian Presidency stressed its focus around a strong, globally competitive, digital Europe. If you had to point to its legacy, what would that be? I hope we will manage to finalise the European investment plan, and I hope that the Eastern Partnership summit will bring benefits for the partner countries, but with digital Europe and the digital agenda, we have already improved the rules for reducing roaming costs and data protection, and we are moving in this direction. I hope the Commission will get the joint strategy for the Digital Single Market approved. In March, we started building the Energy Union. These are the sort of things that we would like to leave behind us. Our vision is to build a competitive Europe and an inspiring Europe. Of course these projects are important steps, but in terms of vision, competitiveness and inspiration are what are important for us. I would like to link economic growth with increased social inclusion. “If Russia attacks the EU, the Treaty will be enforced”. That has no effect. All the EU will do is send medicine to Latvia while it gets destroyed. And then sit around a table trying to work things about while Latvia gets annexed. What the Latvian President was really trying to say was if you invade us, expect to see much much more of the US. If Russia attacks, Latvia will be annihilated before NATO can effectively respond. The NATO base in Poland will become target uno number one. Russia won’t be the first to attack, leave that to the United Stooges of America. That is a war in which there are no winners. It would be end of Russia as a viable nation. Russia isn’t attacking anyone – this is NATO fear-mongering to justify their existence and thirst for more money. Wawww…all those Russian troop – and tank concentrations at the Latvian border ready to invade that poor little country!!! That lunatic woman is as crazy as Porko and Yats the Rat together. She needs a lot of therapy to have a real chance to recover. The dog barks but the caravan goes on.